I recently installed ZSH on my Antergos laptop (which replaced my user’s bash with zsh). I then uninstalled it, incorrectly, and when I rebooted my computer I couldn’t log in as my user. I signed in as root and then, following a tutorial on google, uninstalled LightDM and installed gdm so that I could use a GUI rather than being forced to use TTY. When I figured out that the issue was ZSH being uninstalled incorrectly, I reinstalled it, rebooted, and I could sign into my account again, but now I can’t lock my laptop or sign out of my account. I uninstalled gdm and reinstalled LightDM and also re-enabled it with sudo systemctl enable -f lightdm. How do I fix the LightDM setup so that I can lock my computer again? 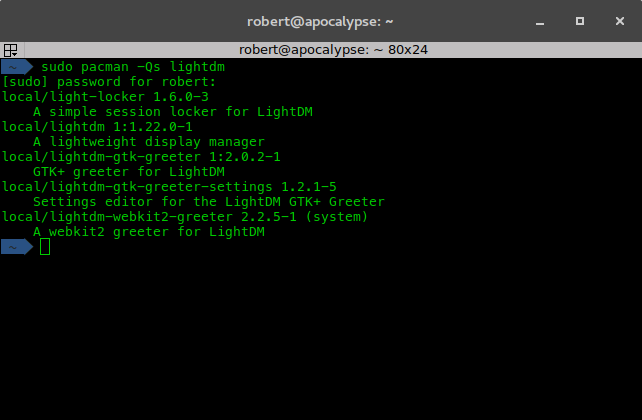 Lightdm-locker is installed (light-locker), as is light-locker-settings. How do I activate it? Do I need to reboot for it to take effect? You can run light-locker-settings it is the settings GUI, to setup as you want. @joekamprad I’ll reboot as soon as I am able and will let you know on the progress. @joekamprad I rebooted my laptop, signed in, waited a moment, and then pressed SUPER + L to lock my laptop and nothing happened. Edit: There is no log out or lock buttons in the top-bar drop down status menu. There is only Settings and Power now. There used to be Lock and Log Out buttons. looks like a Gnome desktop? @joekamprad Yeah, it is a Gnome Desktop. And before your misstake it works? Because i try alot of times to get this worked out with lightdm and light-locker and never solved to get it running with Gnome. Should bring you the buttons back. Before my mistake in uninstalling Lightdm, yes, it worked perfectly with a Gnome setup. 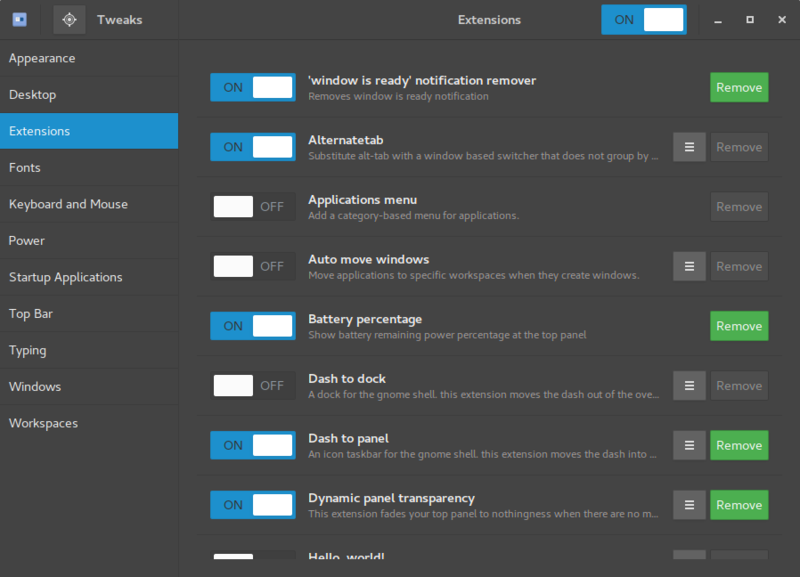 I installed the extension and the buttons are back, but they don’t do anything. I ran journalctl -f and pressed the buttons but nothing happened. 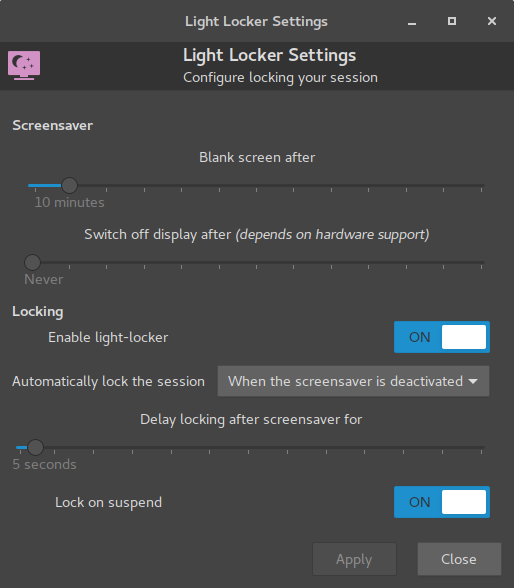 As i do not use lightdm anymore and lightlocker-settings does not save the settings i have no more idea. I noted there’s a Xsession file in /etc/lightdm/. Any idea what that could mean? Edit: it’s because I was running it as root. and do you try setting it up with light-locker-settings? I’m using the webkit2 greeter. Do I need to use the gtk greeter? Thank you for the help, apologies for the delayed response. I’m using a workaround by binding SUPER+L to execute the command dm-tool lock. I’ll mark the topic as solved. Thank you.